The 1st Annual Temecula Blues Festival | April 21st, 2018 - TheUrbanMusicScene.com | Concerts & Festivals! 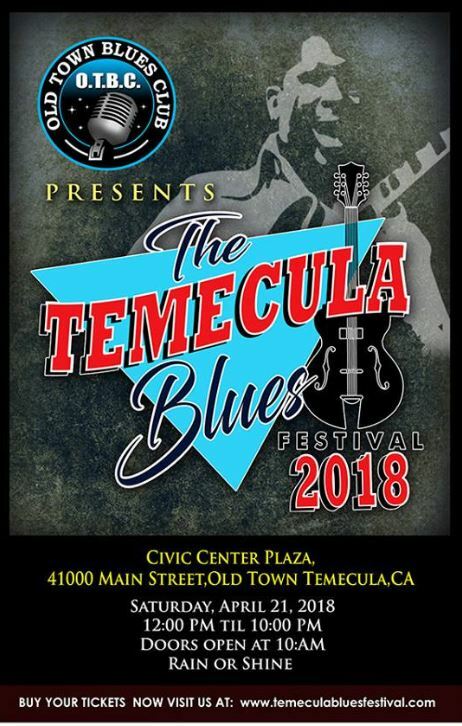 (TEMECULA, CA) – The burgeoning SoCal Inland Empire finally has it’s very own Blues Festival with the advent of the 1st Annual Temecula Blues Festival, Civic Center Plaza, 41000 Main St., taking place Saturday, April 21, from 12 Noon until 10 pm (rain or shine). Tickets: $38., now available online at https://www.eventbrite.com/e/temecula-blues-festival-tickets-37343345953. Info: (951) 676-2722. Presented by The Old Town Blues Club (formerly The Lucky Stone). All ticket sales final. Multiple BMA nominee, vocalist Tad Robinson, headlines a strong eight-band bill that also includes San Diego-based guitar ace Stoney B. Blues Band; highly-regarded South Bay vocalist, Shari Puorto Band; blues harmonica at its best from The Honey Lickers; Chris Fast Band; Bill Magee Blues Band; Cash N Freedman; and JD Priest Band. There’s also a Vendor Blues Village featuring Blue Beat Music; Ugly Hands; Blues Festival Music; and many more. A top-end assortment of food vendors include Rene’s Cowgirl Cantina (Gourmet Mexican); Rosati’s Authentic Chicago Pizza; Laurent’s Cafe’ (French Pastry Sandwiches); Devilicious Cafe; Rock N’ Jenny’s Italian Subs; Bad To The Bone BBQ; The Bridge at 3rd Fish N Chips; The Bank (Mexican Food). No less than eight quality Inns and Hotels give the concert-goer the option of staying the night, with great live bands on Sundays at the Old Town Blues Club nearby. “This festival will be the first of annual blues festivals to follow, so go ahead and make the decision to be a part of this inaugural event and make a weekend out of your trip to lovely Temecula,” says TB Promoter, Andy Doty. “You’ll enjoy yourself immensely.” The Temecula Blues Festival will be held on the plaza, a beautifully-landscaped area with trees, grassy areas, park benches and a serene water fountain to create the perfect Spring day concert environment. Temecula, which is situated within a population of twenty-million Southern California residents, is alive and kicking as a regional hot-spot, entertainment destination. Nowhere else in the country can a person wine taste at 40-plus wineries, beer taste at approximately a dozen micro-breweries, gamble and/or stay the night at California’s largest casino (Pechanga) and experience a large volume of nightly, live music entertainment right in the heart of Old Town, which has a little bit of everything to offer including unique restaurants, boutique retail shops, hotels, museums, theater, art, antiques, a weekend farmer’s market, and a wide variety of live entertainment every weekend. Old Town has over forty annual special events, including the famous Rod Run Car Show each Spring that attracts more than 30,000 visitors to Old Town Temecula.